Hubei province has completed the technical design of its offshore nuclear power station and will soon start its construction, with the first marine reactor to be delivered in 2020. The offshore nuclear power stations, including floating and submarine ones, can sail to where they are needed and be used for many different needs, including operating drilling machinery for offshore oil and gas fields, providing power supply to islands, as well as heating and desalination. 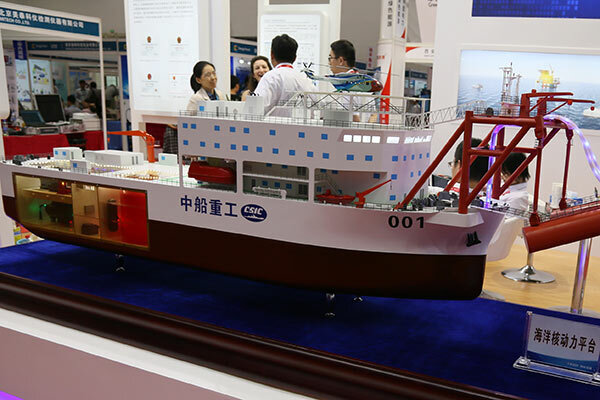 Batch construction of offshore nuclear power stations will result in a market that could be worth tens of billions of dollars in a marine nuclear energy industry chain, according to the 719 Research Institute of China Shipbuilding Industry Corp, the general contractor of the project. The institute was established in 2014 to develop a maritime nuclear power platform and core technologies in the field. Analysts said demand for offshore nuclear power plants is expected to grow in China and will become one of the most significant infrastructures for China's marine area. Han Xiaoping, chief information officer of China Energy Net Consulting Co, said small nuclear reactors can provide cheap and sustainable electricity and can be moved to isolated areas when they reach the end of their service life. One kilowatt-hour of electricity generated by an offshore nuclear plant costs about 0.9 yuan (13 cents), compared with 2 yuan for the same quantity generated by diesel for use by drilling platforms in the Bohai Sea, he said. "Large nuclear reactors have high hydrological and geological requirements and safety has always been a major concern for local residents living nearby." Wu Zhong, general manager of CSIC Asset Management Co Ltd, said earlier that offshore oil drilling demand will keep growing in the next few years with a market value of 100 billion yuan, while the industry of nuclear-powered equipment is expected to reach 50 billion yuan per year in the Bohai Bay. Floating nuclear reactors can also be exported to economies with large populations but scarce land resources, including economies participating in the Belt and Road Initiative, such as Pakistan, Bangladesh and Myanmar, said Han. Zhang Jinlin, an engineer of the 719 Research Institute of CSIC, said the design of the offshore nuclear power station, a typical military and civilian integration project, had taken full consideration of civilian use. "It has also overcome multiple technological difficulties such as safety, radiation protection and waste disposal," he said. China National Nuclear Power Co has also set up a joint venture that would have one billion yuan in registered capital to develop and produce small, floating nuclear power plants. Exploitation of marine resources is vital to China's efforts to build itself into a maritime power, said Wang Yiren, deputy director of the State Administration of Science, Technology and Industry for National Defense.